● BuildDirect has a 30-day money back guarantee for customers in the US and Canada buying in pallet and truckload quantities. 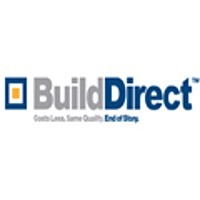 ● Sign up for BuildDirect’s mailing list so you can gain access to special offers and email-only discounts. ● You can order up to 5 free samples online, and BuildDirect will ship them straight to your door without any cost. In this ongoing promo, you can choose among 5 categories—wood flooring, stone and tile flooring, vinyl and area rugs, decking, and siding. ● Shop Build Direct’s Clearance page and you’ll save up to 56% on hardwood flooring, porcelain tiles, and more. Home owners and contractors that are taking on projects around the house can use Build Direct to find the materials that they need to enhance the appeal of any property. The majority of the items that they have available on the website are flooring, ranging from ceramics to decking in backyards. If you need help with designing the project, their website has an inclusive “Design Center” that you can use to get an idea of what the property will look like after it’s done. Customers can browse through the clearance page to find discounted items and view the blog to learn more about upcoming products. For most up to date offers check out Build Direct on Facebook and Twitter or contact Build Direct Support for any questions.